FMP leverages best practices from both the public and private sector and tailors solutions to each client’s unique environment. Our breadth of capabilities covers the full employee lifecycle, including Talent Management, Talent Acquisition, Talent Development, and People Analytics. As a result, the expertise of the FMP team enables us to seamlessly make a positive impact on the distinct challenges of the departments, agencies, and associations we have served. Develop and implement recruitment and hiring strategies to meet current and future workforce needs. We work with you to determine who, what, where, and when to recruit talent for your organization. We also develop tests and interviews to ensure you select the best from your applicant pool. Set workforce planning and succession management strategies so your organization knows the levels of employees and skillsets needed, and has a structured pipeline to identify and develop technical and leadership talent. 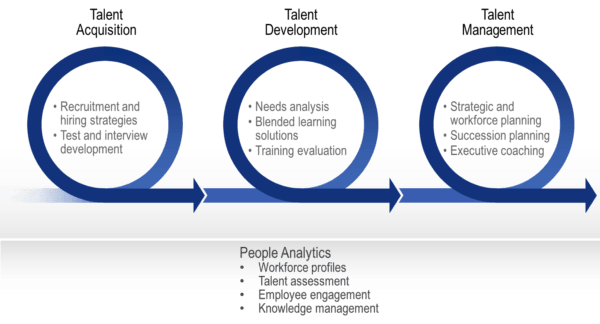 To maximize your human capital strategy, we ensure your talent management, talent acquisition, talent assessment, talent development and people analytics practices are integrated. We work with you to understand the complexities of your programs and develop a phased implementation to accomplish key short- and long- term priorities to meet your organization’s strategic objectives.